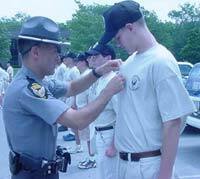 Buckeye Boys State operates a functional BOYS STATE HIGHWAY PATROL, chaired by Officers and Troopers of the Ohio State Highway Patrol. 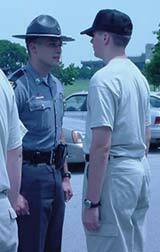 The Boys State Highway Patrol, through learning by doing, performs a number of law enforcement responsibilities within the Boys State program. 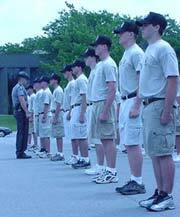 The young men who are selected to form the Boys State Highway Patrol receive comprehensive training in Ohio Law, Law Enforcement, and the role of a police officer. Fifteen (15) Boys State citizens are selected to attend, following the conclusion of Buckeye Boys State, a program jointly sponsored by the American Legion and Ohio State Highway Patrol: JUNIOR CADET WEEK at the Highway Patrol Training Academy in Columbus. More information about Junior Cadet Week. 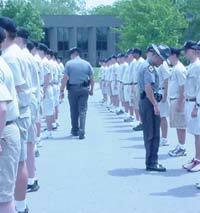 Cadets lined up being closely evaluated. Each waiting for the evaluation. 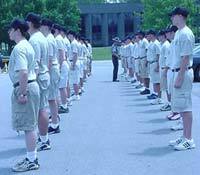 Cadet in line. Officer evaluating. Fixing things like name badges. Checking from head to toe.